As we mentioned recently, the flattening of iPhone sales means that Apple will be getting increasingly interested in finding its "next big thing" because the smartphone market is saturated and without another product to pivot to, Apple could be lost (at least as far as investors are concerned). A new report backs up that idea with the news that Apple is planning a massive bump to its research and development budget. According to a new report, Apple's R&D budget is expected to hit an absurd $10 billion in 2016. For context, Apple's R&D budget in 2012 was only around $3 billion. The theory is that Apple is working hard to find the next product to boost its lineup, because upgrading existing software services and hardware doesn't add up to a number that big, and there have been plenty of rumors in that space. There are the unending reports of Apple working on a car (more recently the rumor is a self-driving car), as well as the fabled Apple TV. 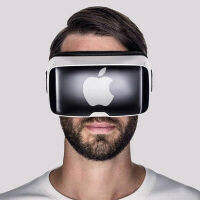 It's widely expected that Apple is also working on virtual reality products as that space heats up. Regardless of what Apple has in the pipeline, it's safe to say it will likely be a departure from the mobile-centric Apple that we've known for the past 9 years. Of course, Apple isn't the only company pouring a lot into R&D. As of 2014, Samsung, Google, Microsoft, Intel and Amazon had already hit $10 billion per year in R&D, so Apple certainly isn't alone in looking for the next big thing in tech. Slap a fruity logo on the Samsung or LG TVs, sell them twice the normal price and the iDiots would sell their children/kidney to buy them. No it couldn't be true, because Apple doesn't want to promote VR. Because everyone including Apple knows that the iPhones give the worst VR experience. They have such a poor resolution. Apple likes to keep the resolutions low so they can boast and brag to everyone on how fast they can push a few pixels on their screens. So please be nice and tell the truth MEeee. OMG I see what you did there!!!! The lower case 'i' in front of the upper case 'D', makes the word idiots into iDiots, kinda like the lower case "i" that Apple uses. You are such a brilliant, original genius!!!! Also funny too, I hope your post gets millions of upvotes as a testament to your creativity!!! NOTHING!..... maybe upgrades to copy and paste. Beyond time they got off their asses and put that $200B to use...here's hoping something actually innovative and useful without any reality distortion field materializes. They're probably investing in a larger reality distortion machine though, so kinda pointless to praise the move. That is a lot of money for a copy machine. Welcome Apple to $10 billion R&D spender. But still quite beloe Samsung even after making higher profit. Do they want to use that money to innovate or copy others and call them their own products with a new fancy name?